College Basketball Oscars: Who would bring home the biggest awards? Argo took home Best Picture at Sunday night’s Academy Awards, but who is deserving of similar awards in college basketball? CollegeBasketballTalk compiled a list and voted for winners in 12 key categories. Take a look at the list below. Have a differing opinion? Feel free to vote for your own winners in the comments. This one had all the elements of a true masterpiece. There are good college basketball games, then there are those like Butler-Gonzaga on Jan. 19. It had all the elements: the “underdog” implications, the national rankings, the late-game drama, the surprise ending. You thought the game was over when Alex Barlow was called for traveling with 3.5 seconds to play? Wrong. Roosevelt Jones’ steal, weave, and floater as time expired gave Butler the win and cemented a place in highlight history for years to come. When Burke made the decision to return to Michigan for his sophomore season and put off his NBA dreams for another season, he knew that he was walking into a leading role. He knew he would inherit and team with talent and national title aspirations in the nation’s toughest conference and, like Daniel Day Lewis in Lincoln, he has shouldered the weight of those expectations. Oladipo has emerged throughout the season and shown that he has the single most important characteristic of a supporting player: versatility. One night, he could carry the Hoosiers offensively. Another night, it is his defense that makes Indiana go. He may even bring everything together into one performance that is truly masterful, like when he had 21 points, seven rebounds, six steals, and three blocks in a win over Michigan State on Jan. 27. There’s always room for a low-budget film in the College Basketball Oscars. None is more deserving than the moment Frantz Massenat gave us against Hofstra. With seconds remaining in regulation, Massenat heaved a shot from beyond half court between two defenders and nailed it, giving Drexel the 55-52 win. Perfection. We’ve seen similar shots, like Ben Brust’s prayer against Michigan on Feb. 9 that sent that game into overtime, but sheer distance and the fact that it was for the win gives Massenat the nod. 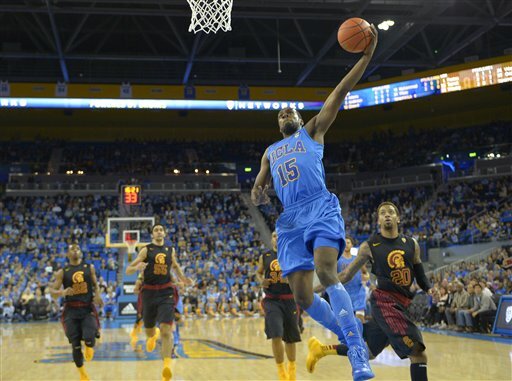 In a year that has seen its share of new uniforms, including the logo-prominent Nike look to adidas’ monochromatic experiment, UCLA’s blue alternate jerseys stand above the rest. The designer takes care to contrast the lighter blue with a sharp navy color for the number, but also makes one key addition. Where the monochromatic jerseys failed, these succeed. A thin bit of gold outlines the numbers and makes them pop. Important. Considering the undertaking, for Franklin to even attempt a moment like this is almost unthinkable. To have captured it so perfectly is something else entirely. But that is a mark of a great innovator. He is not afraid to take chances. As a wise man once said, “You miss 100% of the off-the-backboard alley-oops to yourself that you don’t take.” Perhaps I’m paraphrasing, but the message still rings true. Very little can be said, other than to let the image speak for itself. The Casablanca kiss pales in comparison. With the cloud of an impending NCAA investigation hanging over the program’s head, Larranaga has worked with a group of veterans that he largely inherited to become a force in the ACC and a contender for a top seed in the NCAA tournament. College basketball lacks a dominant team this season, which makes Larranaga a clearer choice, considering the expectations going into the season, a non-conference loss to Florida-Gulf Coast, and the injuries that the Hurricanes have endured. He has mastered a range of styles, key for any director, helping Miami to win at a slow, grinding pace, or more up-tempo and in transition. He caps it all off with his personal masterpiece, a 27-point drubbing of then-No. 1 Duke. Bravo. Dellavedova comes from a program that has a history of producing and developing quality Australian-born players. He is simply the next in line. In the off-season, he developed his game by adding muscle to his frame, making him a player with more physical tools with which to work. He knows how to work the whole “persona” thing, too. His oversized mouthguard is unique and helps him stick out more than just his 16.1 points and 6.3 assists per game already do. There are nights when one player simply cannot be stopped. On Feb. 23 against Colorado State, Kendall Williams had one of those nights. The junior shot 12-of-16 from the floor, including 10-of-13 from three-point range on his way to 46 points and a nine-point New Mexico victory. Consider the stakes of the game, with both teams ranked and fighting for position in the highly contested Mountain West, and Williams’ performance shines even brighter. A breakout performer turns a quality project into an elite one. This is what Kelly Olynyk has done for Gonzaga. Olynyk redshirted the 2011-12 season and came out of it now averaging 17.7 points and 7.0 rebounds per game. He has shown the ability to attack defenses in a number of ways, whether it is around the rim, off the dribble, or on the perimeter. Gonzaga has ridden the classic underdog narrative to a 27-2 record and a No. 3 national ranking. The Bulldogs are hoping that this one ends with triumph and possibly even a national championship. The Lifetime Achievement Award is given to the nation’s best fifth-year senior. Its recipients are part of a select group, one that only has players who have continued to produce long after others around them are past their time. Coach Bill Self and Kansas has had continued success because elite players leave and more fill in seamlessly behind them. This season, Withey is that elite player filling in the gap left by the depature of Tyshawn Taylor and Thomas Robinson and is one of the main reasons that the Jayhawks are eyeing another Final Four run. For that, Mr. Withey, we honor you.